Where to begin with these two? Let’s start at the beginning. Let’s start in the school halls where Shelbi and Josh met, and in high school, where they started dating. They were together for about eight years before they finally tied the knot. That’s exactly how we did it – eight years of dating and growing up together before finally taking the leap. So, we think there is something especially touching about high school sweethearts. All love stories are special, but something about that young love that morphs and grows into an old love and lifelong promise is something special. The ones who meet before they even know what love is, but believe in what it is that they have. The ones who grow up together and choose to never ever give up on each other. The ones who watch each other graduate from high school, go to college, and get their first jobs to then get to be there as they raise a child and grow old and gray. It gives us chills to think about it. 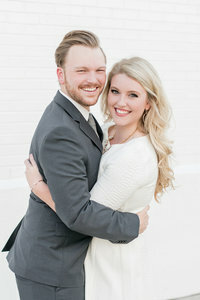 We also love the story of how Shelbi and Josh got engaged. Josh had Shelbi’s engagement ring for an entire month! Josh was originally planning on proposing in Gatlinburg, Tennessee around Shelbi’s family, but the trip was canceled last minute. He then planned a Vulcan Park proposal, but Shelbi came down with a stomach bug. Third time was a charm when Josh popped the question in the living room right before going out to dinner. It wasn’t a big, elaborate plan, but it sure was awesome when he said “I just couldn’t look at that ring on my dresser instead of on your finger any longer!” Isn’t that the sweetest thing!? We think it happened just like it was supposed to! Shelbi and Josh, your wedding day was amazing. The rain didn’t take away any of the magic. If anything, it made the day all the more special! You are such beautiful human beings, both inside and out, and we are so happy to call you our friends! Congratulations on finally becoming man and wife. We know it was a long time coming, and we know how perfect you guys are for each other. You can see it in your wedding photos and in the way you look at each other. We can see your friendship in the way you tease each other and the jokes you tell. We’re so honored we got to be a part of such an amazing event, and we hope you guys know how incredible we think you are!